The Voyager does more than just maps though. The list of capabilities includes GPS trail logging, GPS speed, engine rpm, distance, run hours, compass, altitude, ambient temp, and engine temp-any of which can be displayed on the customizable interface. 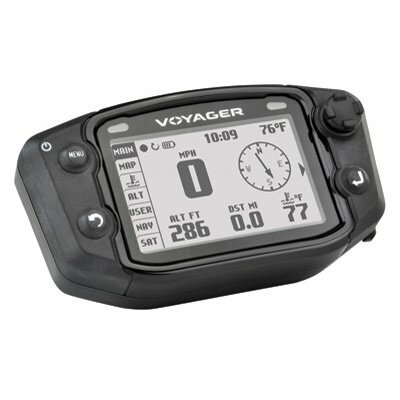 Info is displayed in real time, but the Voyager adds another layer by storing performance and trail data to review later. Bikes that do not have AC power will need to use an AC wall charger in order to charge this unit.